On the Bring-Something-Old-to-School day, Milo`s best friend Shane brings part of a carved ancient stone from his granny`s garden. 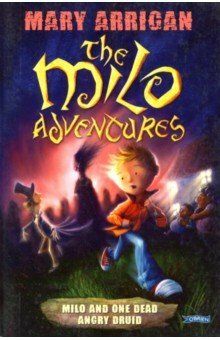 When it is presented in class, Willie Jones`s pet lizard goes crazy and Milo realizes this is no ordinary stone. Afraid that his granny will be annoyed with him for taking the carved stone, Shane asks Milo to mind the stone until the coast is clear. However, Milo encounters the ghost of Mr. Lewis. He too is searching for the piece of ancient stone, which is part of a druidstone. He needs to find both pieces of the stone to lift a curse put upon him many years ago. But where is the other half of the stone?